Every year Christ Church holds its Tenebrae service on Maundy Thursday night (the night before Good Friday). This is a time for quiet reflection and appreciation for the suffering of Jesus Christ during his betrayal and crucifixion. Tables were laid out in the form of the cross with candles creating the only light. The service commenced with a hymn followed by a brief but enlightening sermon from Glyn Millington. “I’m glad resurrection Sunday falls on April fools day this year as the reality of the resurrection is anything but foolish,” he said and then proceeded to trace Jesus Christ’s life by pointing out how, in the eyes of the world, His life appears to be non-descript yet He changed history forever. He was born in a manager, His family became refugees in Egypt where He spent some of his boyhood, they then returned to a remote village in Israel where His father was a carpenter. His ministry was primarily to the working class – He didn’t sit on any political or religious councils and He didn’t ever “market” Himself. With His background, the fact that He became the most influential person in history is testimony to what the Bible says – “The foolishness of God is greater than the wisdom of man”. 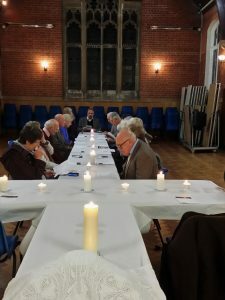 After the talk and another hymn, we had communion followed by readings by different people from the Gospel of John about the stages leading up to the Crucifixion. After each reading, the reader extinguished a candle till at the end we sat in contemplative silence in the dark then dispersed quietly and reverently. This then leads us into the joyous celebration of the resurrection on Sunday.